House additions are normally more cost effective than trading up to a larger home. 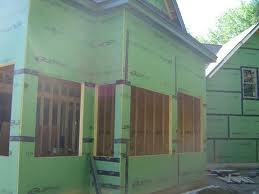 Building a house addition onto your existing home is a large home remodeling project. House additions require careful planning and budgeting. A house addition should be designed such that it blends into the existing home as if it had always been there. House additions are an ideal way to increase the living space requirements of a growing family. In most cases it is less expensive to build a house addition rather than trade up to a larger home. House additions also provide the benefit of not having to uproot the family from their current town and neighborhood. In most cases, the cost of a house addition is more than made up for when the home is eventually sold. House additions also afford you the opportunity to be creative with your home addition plans, and allows you the opportunity to customize the house addition plans to your specific needs. So whether you are planning a bedroom addition, family room addition, bathroom addition, kitchen addition, or a combination of different living spaces, you have the complete freedom to choose what features you want to include in your house addition. House additions are very similar to building a new home. Most, if not all, of the same types of subcontractors are required. Consequently it is critical that you have a full set of house addition plans in place before going out for contractor bids. When developing your house addition plans it is important to make sure the new house addition melds into the existing home as if it was always there. Too often I have driven by a home that has had a house addition built onto it that is either too large relative to the existing home, or looks like an aberration hanging off of it. So spend the time and money up front developing a well thought out set of house addition plans. Make sure the house addition is of proper scale to the rest of the home and that it accents the existing home versus consumes it. Having a good set of house addition plans will also help in obtaining accurate house addition estimates from building contractors. When planning house additions, it is important to review existing plot plans. When reviewing plot plans look for key items that could impact your decision on where to place the house addition. Key items to watch out for are water and utility easements, artesian wells, leach fields and septic tanks, underground utilities and property setback requirements. You may want to visit your local zoning board or town building inspector if you have any questions on the house plot plan. For most people a bank loan is required for adding on a house addition. Visit your local bank during the house addition design stage to understand how much of a loan you can, or want, to obtain. The size of your budget will play an important role in the size and amenities of your house addition. Once you have a set of house addition plans in hand, you can then go out and get house addition bids from contractors. Finding the right general contractor and/or subcontractors is a critical phase in your house addition project. You do not want to hire the wrong contractor(s) for your house addition project. Hiring the wrong contractor frequently leads to cost overruns, slipped schedules, and a house addition that is not built to plans. One way to find quality house addition contractors is to use one of the national house addition contractor referral companies. These companies have extensive databases of qualified and pre-screened contractors that they have already vetted out. The cost of their services is free to the homeowner. You simply fill out one of their free online forms for your specific house addition requirements and they forward the information on to 3 or 4 of their pre-screened contractors in your local area. The contractors will then contact you to set up a time to meet with you to review your house addition plans. When obtaining estimates for house additions it is critical to make sure that each contractor provide you with a complete house addition cost breakdown sheet for every phase of the house addition project. The more detail in the house addition cost breakdown sheet, the more likelihood of an accurate house addition cost estimate. To help obtain consistent and accurate house addition contractor quotes, see my Home Addition Bid Sheets. 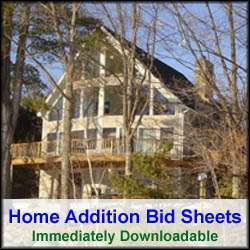 My Home Addition Bid Sheets provide a request for quote section that you can provide to prospective building contractors. It also includes a comprehensive house addition cost breakdown table, in Microsoft Excel format, that allows the contractor to include his projected house addition costs for every phase of the project. By using my home addition bid sheets you can obtain consistent quotes from contractors so that you can make apple to apple comparisons on contractor bids. When interviewing potential contractors for house additions make sure to check references. Usually a good indicator for evaluating a house addition building contractor is the length of their reference list. The longer the list provided to you, the higher the probability that the contractor has a good reputation. A long reference list also helps to get a sense for how long the contractor has been in business and his level of pride in his work. It is always important to contact at least 3 or 4 of the references, regardless of the length of the reference list. I prefer to contact a couple of his recent projects followed by a couple of his older projects that were done a few years out. This way I can get a sense of his current work ethic and his quality of work. With these simple tips your house addition project should go smoother. Just remember that house additions will impact the family for awhile. Also, house additions typically cost more per square foot than brand new home construction projects due to the fact that extra effort and time is required to build the addition into the existing home. This said, the overall costs associated with house additions is still cheaper than selling an existing home and buying a new one in most cases. Good luck with your house addition project! For more help on building a house addition, see HomeAdditionPlus.com’s Home Addition Bid Sheets. Our Home Addition Bid Sheets provide you with the knowledge and information on how to plan a home addition project, and what to look for when hiring contractors. They also include detailed cost breakdown tables and spreadsheets for estimating your own new home addition building costs.